Just when we thought there could be nothing else to report on the birds, a report from Cambridge that Birds 1 was in use in machine 2 this week. They were probably loaded in the machine on 23rd/24th, and were probably exhausted late on 25th or during 26th. This is a set produced on 25 January. Our reporter writes: "Normal usage is 95-100 transactions per day (and is remarkably constant) and there were 193 transactions in a day and a half. So someone may have bought a number of strips with individual receipts." Despite our best endeavours (thanks John and Richard) we didn't manage to get any of these for our customers - yet. 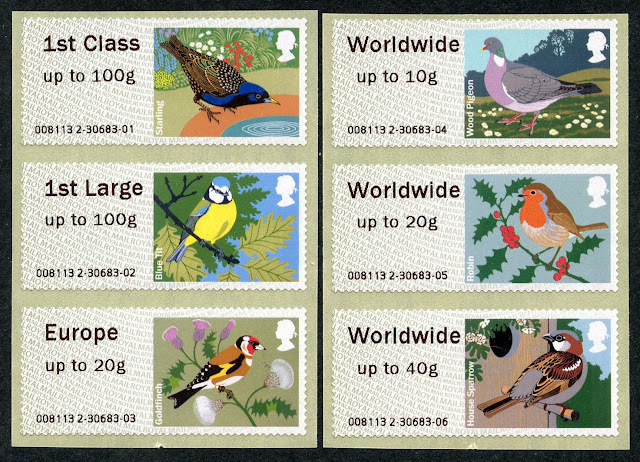 Apparently the person who loaded these into the machine "wasn't aware that it was old stock, or that the stamps were different from the current birds stamps." So if Cambridge can have some old birds hidden in a back-office, so could other Birds 1 offices! Also a memo has been sent to all Post and Go offices in the last month telling them just to use up ALL Birds stock - flushing out the system I guess ready for the new series. So I expect many old Birds will be flying around this month! "I don't know if you are aware that the premises changed during the Birds 1 issue. Originally it was at 9-11 St. Andrew's St. Those premises were vacated on 8 Jan 2011 and moved to 57-58 St. Andrews St. on 10 Jan. The branch code changed from 007113 to 008113." This may be the reason that the Birds 1 roll was misplaced and only resurfaced last month.